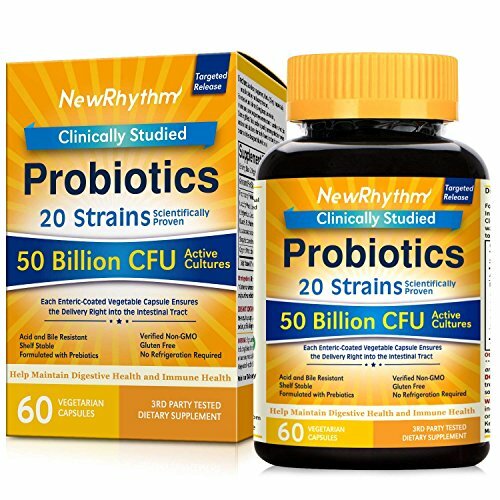 NewRhythm Probiotics clinically proven formula contains 50 billion CFU active culture and 20 strains targeted benefits. It is the ultimate digestive supplement to brace the digestive system and to maintain the intestinal health. The formula is hypoallergenic as it is free from gluten, artificial preservatives, soy, etc. buy it now by hitting order now. ★MADE IN NEW YORK, USA★ NewRhythm 50 Billion Probiotics is made in an FDA Registered Facility in New York, USA. Our Facility is Organic Certificated and GMP Certificated by NSF, which Represent the Highest Level of Technology, Quality Purity and Consistence. ★100% SATISFACTION OR 100% MONEY BACK, GUARANTEED★ We stand behind our products with confidence. If in anyway you are not completely satisfied with our products, please let us know in 30 days, we will give you money back.